Updates have been few and far between lately but the Encounter Table is still here! I've been working more steadily as a freelance author for Paizo and other 3rd-party publishing companies, so my time here is limited. Now that my current projects are under control I've had time to revisit some ideas I've had waiting in the wings. Updates will continue to be sporadic for the foreseeable future, but I haven't forgotten about the Encounter Table or its readers! In today's update we delve into the Technology Guide and explore an alchemist archetype designed to survive in the harsh wastes of Numeria and salvage technological artifacts! Check out the technologist archetype after the jump. While alchemy seeks to emulate magic through the fusion of supernatural and chemical reactions, some alchemists shed the supernatural trappings of their research to devote their study to Numerian technology. While they lack the understanding to fabricate these magnificent devices on their own, technologists strive to salave and repair relics from the Silver Mount. A technologist prepares extracts from his formula book as a normal alchemist, however each day he is also able to prepare a schematic in place of an extract. Schematics are technological writings blended with arcane formula and alchemical reagents that enhance or otherwise affect constructs. Positive energy effects (such as cure light wounds) written into a schematic affect constructs as if they were living creatures. A technologist may expend a prepared schematic to effect a touched construct with the formula contained on the schematic. A technologist may not use a schematic on himself unless he is also a construct. This ability modifies alchemy. At 1st level, a technologist adds one of the following spells to his formula book using the lowest available spell level to determine formula level: detect radiation, discharge, greater discharge, irradiate, magic circle against technology, protection from technology, recharge, remove radioactivity, and technomancy. The technologist adds an additional spell at 5th level and every 5 levels thereafter. At 1st level technologist gains a salvaged piece of Numerian technology retrofitted with unique power cells fueled by the same chemical reaction of an alchemist's bomb class ability. These pieces of salvaged technology function only for the technologist and cease function immediately if dropped or handed to another creature. A technologist may choose one of the following devices at 1st level. 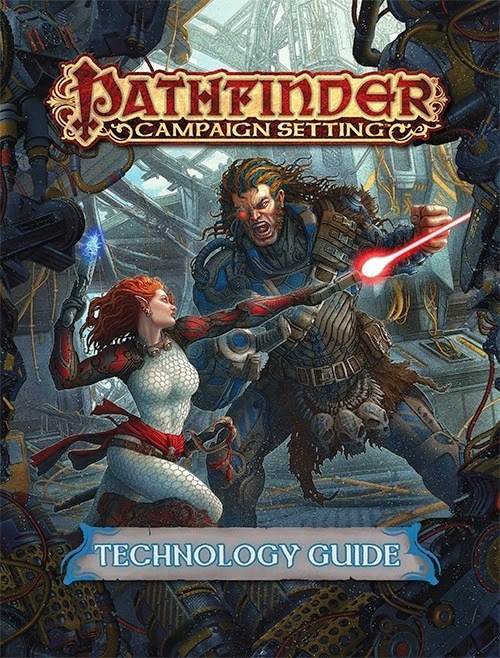 Shielding Unit: This device grants the technologist a force field (see the technology guide more information) with a number of hit points equal to twice the technolgist's level. At 10th level the technologist may force his shielding unit to reboot after its total hp are depleted, reactivating the forcefield with half its total number of maximum hp. After the shielding unit has been deactivated a second time it may not be reactivated for 24 hours. Drone: The technologist gains the service of an arachnid robot, but lacks the explode ability of normal arachnid robots. This robot responds only to the technologist's orders and ceases to function if it travels further than 500 feet from his location. The arachnid robot speaks all of the technologist's languages and uses the technologist's skill modifiers for skill checks or its own (whichever is better.) A technologist's drone may prepare his extracts and schematics for him from his formula book each day. If destroyed the technologist may repair the robot by spending 1 week of time and 300 gp in materials. At 10th level a technologist's drone gains the advanced creature simple template. Plasma Grenades: A technologist plasma bombs function identically to the bombs class ability of a standard alchemist, except their bombs deal 1/2 electricity and 1/2 fire damage and are considered technological devices. Plasma Sword: A plasma sword is a two foot long handle of plastic and metal that can be activated to produce a three foot long blade of contained plasma as a swift action. A plasma sword deals 1d6 points of damage at 1st level (half of that damage is electricity, the other half fire) plus an additional 1d6 points of damage every 2 levels thereafter as a melee touch attack that does not apply the technologist's Strength modifier to damage. A plasma sword is can be deactivated as a free action and is considered a light weapon for purposes of feats and abilities. The plasma sword may only be active for a number of rounds per day equal to 3 + the technologist's Intelligence modifier, though these rounds need not be sequential. At 3rd level as a swift action, a technologist can expend an unused extract or schematic to power a technological device he touches. Each spell level expended in this way grants the device 1 charge. Any charges unused at the end of the round are lost, and any charges used by the device that round that aren't provided by the technomancer must come from the device's own power reserves. He can use this ability to power timeworn technology. He can't power devices that don't use charges. This ability replaces swift alchemy. At 2nd level, a technologist gains a +2 bonus on all saving throws against radiation. This bonus increases to +4 at 5th level, and then again to +6 at 8th level. At 10th level, a technologist gains immunity to radiation. This ability replaces poison use and poison resistance. Thank for your great article. Make me know about game..